Nicknamed “the patent leather kid with the new-penny eyes,” the Bombay is winning the hearts (and homes) of cat fanciers all over the world. Read on for all things Bombay; personality and facts you need (and will want) to know. Indeed, a beauty to behold, everything about this feline is black. From its nose to the tip of its tail and bottom of its paws, the cute black cat superstition has no place with the Bombay. If you’re a newbie to this fur baby, you’re in for a real treat. RELATED: Check Our Cute Cat Lovers Gift Ideas. Like most breeds of felines that took genetics, patience, consistency, and a little luck to produce, the Bombay is no exception. Did you know the Bombay cat has black pads on its feet? This is a rare genetic trait that other breeds do not possess. Although named after the exotic port city in India, the Bombay has no history in that area. It was, in fact, breeder Nikki Horner (Louisville, Kentucky), that is credited for developing the Bombay. She started this endeavor in the late 1950s, with a goal of producing a sleek, shiny black cat with a muscular body. Some say this domesticated feline is a salute to the wild panther. British breeders were also able to achieve the same look and personality with crosses of Burmese and black domestic shorthairs. The CFA gave the Bombay full recognition in 1978 and today, the breed is recognized by all cat associations. Since the Bombay was to resemble a miniature panther, there is nothing sharp or angular in its appearance. Its head is pleasant to behold, large, rounded, and tapering to a strong, short muzzle. The ears of this feline are medium in size, broad, slightly curved, and widely apart; giving it an alert expression. The tail of this breed is straight (never kinked) with a short, dense, magnificent coat that lays flat against the body. If you are fortunate enough to meet a litter of Bombay kittens, you will notice a subtle tabby striping, which will slowly fade then disappear as they develop. Their wide-set eyes are (like most kittens), blue at first, turning grayish to a beautiful gold or deep copper when fully mature. Adult Bombay’s are stocky and somewhat compact – they are more substantial than they appear – being very muscular with dense boning. Their characteristic walk is more of a sway, lending itself to be reminiscent of the Indian Black Leopard. You can expect to find this feline hogging the warmest spots in the home, including snuggling under the covers at night with his favorite human. Bombay’s will adapt nicely to most situations and are even suited to apartment dwelling. If you want to allow your feline friend to enjoy nature, the Bombay can be trained to walk on a leash and will even indulge their family in a game of fetch from time-to-time. Take it from me there’s nothing quite like experiencing the great outdoors with your favorite feline pal, or when they are so engaged in playing that they will actually return a toy to be launched again and again. Plus, you may find yourself entrenched in a chatty conversation with your furry pal, as the Bombay has a distinctive, but not overly loud, voice. Bombays thrive in a loving environment that wants a pet to be a part of the family, not just a visitor at mealtimes. This breed does not do well when left alone and must be a part of a loving, pet-orientated household. As devoted pet parents would we really want it any other way? Did you know the Bombay cat is also nicknamed the “Velcro Kitty?” This is because it likes to stick close to its special human. Like all cats, the Bombay is a carnivore and therefore needs a diet that is high in good-quality protein. These sources of protein can include chicken, foul, beef, or salmon. Although high-quality dry kibble is the main staple of most pet’s diets, I find adding a small amount of canned food to your Bombay’s daily meals gives your feline a boost of both moisture and of protein. Whether you choose a dry kibble and/or wet food, you will want to use a well-balanced diet for your cat. Read the labels on the side or back of the bag for the nutritional content. “It’s trendy to bash grains and carbohydrates in pet food, but those are not necessarily bad, Churchill says. To know if your cat’s food is well-balanced, Dr. Hill gives us this tip; look for a statement from the Association of American Feed Control Officials (AAFCO) on the package. The Bombay cat is generally healthy, although there is one issue that has been seen in this breed, as well as the Burmese Craniofacial defect. This condition causes severe craniofacial malformations and is immediately apparent from birth. It is severe and causes an abnormality of the lower jaw, and nostrils, degeneration of the eyes, and ears, and protrusion of the brain. Your Bombay will not have this problem as kittens born with this condition are euthanized as normal life is not possible. When seeking a Bombay companion, always adopt from a reputable breeder to ensure your feline friend is not a carrier of this craniofacial defect. 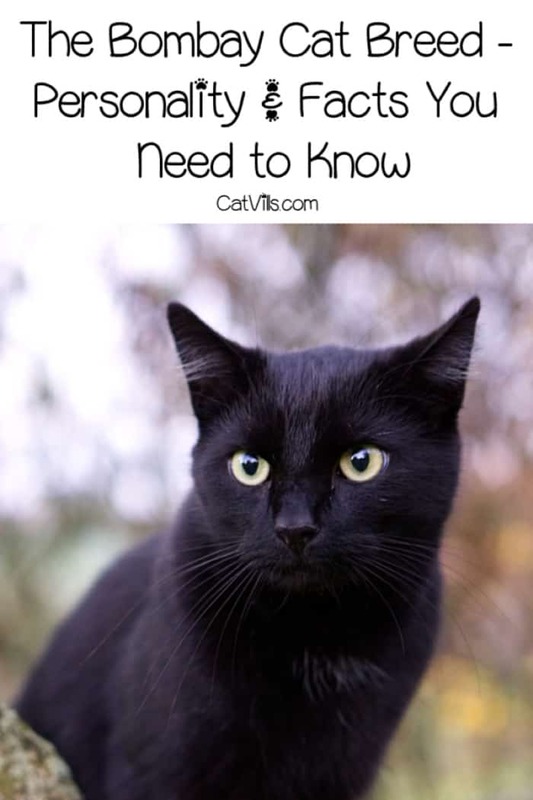 Did you know the Bombay cat tends to gain weight? However, because of their black coats, it doesn’t tend to show, so be sure your pet isn’t getting porky! With this remarkable coat, you will want to groom your Bombay with a few strokes of your hand each day or I make a point of scheduling a weekly brushing. You can also choose to use a chamois to remove dead hair, and to distribute the skin’s natural oils, leaving the coat with that shiny polished look. They work wonderfully and are easy to launder, too. The good news is bathing your Bombay is rarely necessary. Good oral hygiene is also a must-do for your Bombay cat. Daily brushing of your pet’s teeth helps prevent periodontal disease. 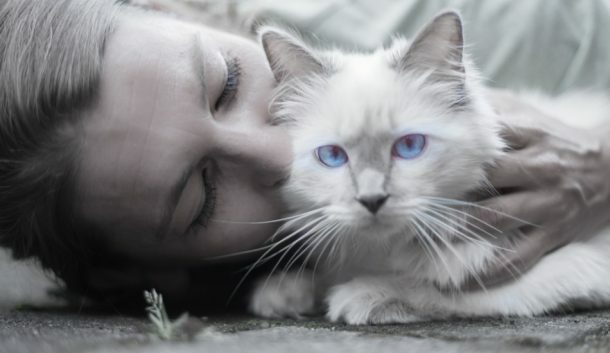 Help your feline keep his face clean by wiping the corners of the eyes with a soft, damp cloth to remove any discharge. To be on the safe side, use a separate area of the fabric for each eye, so you don’t run the risk of spreading any infection. Also be sure to do a weekly check of your cat’s ears. If they appear to be dirty, wipe them out with a cotton ball or soft damp cloth. Use a 50-50 mixture of cider vinegar and warm water to kill any bacteria in the air canal. Never use cotton swabs, as they can damage the interior of the ear. When it comes to the litter box , the Bombay breed (as with most felines) can be a bit picky about its cleanliness, so be sure to scoop the poop and urine after it has been deposited. Since there are so many homeless cats in the world today plan to spay or neuter your Bombay at six to nine months of age. However, watch your Bombay for signs of sexual maturity – It’s not unheard of for Bombay’s to reach this life-stage as early as five months of age. Lastly, Bombay’s make great indoor pets, so consider keeping your furry buddy safe inside. Diseases, wild animals, attacks from other cats, dogs, people, and wildlife, and the potential to get lost or hit by a vehicle are all excellent reasons to make your pet an indoor-only feline. All my cats have been indoor pets, and I don’t believe they have suffered for it one bit. In fact, they have all lived well into their late teens. Did you know the Bombay breed likes to stare? Once they set their gaze, it may linger there for a while. The Bombay breed loves its playtime. Provide her with plenty of floor toys, and interactive toys to stimulate her brain and muscles. Cat trees, kitty condos, and perches are also excellent items to get your Bombay cat up and moving. These are particularly important for indoor cats as it encourages those natural climbing, jumping and pouncing instincts. The SongMics Multi-level kitty condo is an excellent choice for any active feline. It features multi-level perches and hiding spots, sisal, and carpet for a variety of scratching surfaces (saving your furniture), as well as hanging balls to practice those hunting skills. Plus, it’s reasonably priced so you won’t break your budget. Did you know the Bombay cat is very tolerant and patient with children and even dogs? As long as they are treated well, the Bombay can get along with most anything. Tip #1 – Always use positive reinforcement, not punishment. A great way to do this is by using small bits of chicken, turkey, or tuna as a reward for a job well done. Find out which treat your Bombay likes the best and use it as an incentive. Tip #2 – Keep the training sessions short. Once your cat becomes bored or disinterested in the trick or task, end it and resume later. Tip#3 – Get your Bombay’s attention. Experts recommend using a clicker when training a pet. These small devices make a distinct clicking sound, so each time your cat does something you want it to (like a trick), make the clicking sound and give it a treat. The sound and positive reinforcement (reward) of the treat, condition your cat to repeat the behavior. Check out the clicker on Amazon. Tip #4 – Use repetition. Cats learn through repetition so when training your Bombay try doing short sessions several times each day, rather than one long session. Tip #5 – Repeat the trick. Repeating the trick 5 to 10 times in a row will help to reinforce the behavior. To make this effective, when your cat completes a skill, give it a treat – as long as it is interested in doing so. Tip #6 – Don’t use cue words. Unlike when training a dog, using a cue word before the cat knows the trick may be confusing. Experts recommend using the cue word (such as Sit) only after your Bombay knows the action. This helps him associate the word with the trick. Tip #7 – Teach only one trick at a time. As we mentioned earlier, positive reinforcement (praise and treats ) helps your Bombay master the lesson. If you try to teach your feline more than one trick at a time, it may not know which behavior it is being rewarded for, which can lead to confusion. Always wait until your cat has mastered one trick before moving on to the next. Tip #8 – Never punish your Bombay for not mastering a trick. Scolding or punishing your cat when it doesn’t complete a task will only cause it to become disinterested, or worst yet, stressed or scared. If your cat doesn’t want to learn a trick or doesn’t perform successfully, try again later. The Bombay cat is not only beautiful, but it’s also loyal, tolerant, with a loving personality that’s sure to win the hearts of even the most finicky of people.